This article is about the town. For the airport, see Port Hawkesbury Airport. 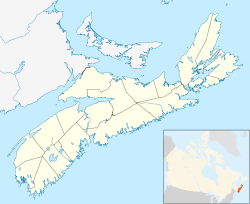 Port Hawkesbury (Scottish Gaelic: Baile a' Chlamhain) is a town located on the southwestern end of Cape Breton Island, on the north shore of the Strait of Canso, in the Canadian province of Nova Scotia. The town was originally named Ship Harbour (after the harbour upon which it is located) and is largely a service centre for western Cape Breton Island with many of its residents working in large industries in an industrial park located in the adjacent community of Point Tupper, Richmond County. The town's schools are Tamarac Education Centre (Grades primary-8), SAERC (Grades 9-12) and the Strait Area Campus of the Nova Scotia Community College. The community is named after Admiral Sir Edward Hawke. Know by its first name as Ship Harbour, Port Hawkesbury built ships for the timber export trade in the early and mid 19th century, such as the brig James, the subject of one of the earliest ship portraits in Canada. Schooners and fishing boats were also built for the inshore and banks fishery by firms such as the noted boatbuilder H.W. Embree and Sons. The port further developed in the 19th century when railway connections arrived. The construction of the Canso Causeway increased the shelter capacity of the deepwater port leading to further growth in shipping of bulk commodities and the establishment of several heavy industries such as the pulp mill. Port Hawkesbury experiences a Humid continental climate (Dfb). Due to the proximity to surrounding bodies of water, seasons tend to be delayed when compared to areas further inland. Precipitation is high, with the fall and winter being the wettest time of year and summer being the driest. Winters are cold, snowy and stormy with frequent snowstorms. Summer is the most pleasant time of year, with significantly less precipitation and warm temperatures. The highest (reliable) temperature ever recorded in the strait area was 35.0 °C (95 °F) on 7 July 1912 and 19 July 1975. The coldest temperature ever recorded was −28.5 °C (−19 °F) on 7 February 1993. In the 2016 Census of Population conducted by Statistics Canada, the Town of Port Hawkesbury recorded a population of 3,214 living in 1,345 of its 1,554 total private dwellings, a change of −4.5% from its 2011 population of 3,366. With a land area of 8.1 km2 (3.1 sq mi), it had a population density of 396.790396.8/km2 (1,027.6821,027.7/sq mi) in 2016. In 2006 the Port of Port Hawkesbury was the second largest by annual tonnage in Canada, second only to Vancouver, British Columbia, due to large volumes of crushed rock and gravel shipments and oil trans-shipments. It handled 31.6 million metric tonnes in 2006, of which 21.6 million tonnes was crude petroleum. By 2011, the volume of annual tonnage had dropped to 23.7 million tonnes, making it the 7th largest port in Canada. The port is served by tugs of Svitzer Towing such as the tug Point Chebucto. Historically it was a stop for American coastal steam ships. Lynn Coady is an author. Her best selling novels include Strange Heaven, Play the Monster Blind, Saints of Big Harbour, the Giller Prize nominated Antagonist (2011) and the Giller Prize Winning Hellgoing (2013). Mark Day, a film and television actor now living in Toronto and Los Angeles. Aaron Johnson, an NHL draft pick now playing with the AHL's Stockton Heat. Henry Nicholas Paint (1830–1921), member of Parliament for Richmond County, merchant and land owner. His family (settling from Guernsey) received land grants at Belle Vue on the Strait of Canso in 1817 and at Point Tupper in 1863, and did much to develop the local communities in the area. ^ "Chisholm-Beaton sworn in as Port Hawkesbury mayor". 101.5 FM The Hawk. 2 November 2016. Retrieved 2 November 2016. 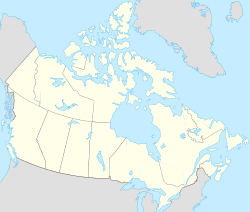 ^ "Place-names of the Province of Nova Scotia". archive.org. Retrieved 2017-01-02. ^ a b c "Port Hawkesbury A". Canadian Climate Normals 1981–2010. Environment Canada. Retrieved 16 September 2016. ^ "Daily Data Report for July 1912". Canadian Climate Data. Environment Canada. Retrieved 16 September 2016. ^ "Daily Data Report for July 1975". Canadian Climate Data. Environment Canada. Retrieved 16 September 2016. ^ "Port Hastings". Canadian Climate Data. Environment Canada. Retrieved 16 September 2016. ^ "Eddy Point". Canadian Climate Data. Environment Canada. Retrieved 16 September 2016. ^ "Port Hawkesbury". Canadian Climate Data. Environment Canada. Retrieved 16 September 2016. ^ "Port Hawkesbury Airport". Canadian Climate Data. Environment Canada. Retrieved 16 September 2016. ^ "I:\ecstats\Agency\BRIAN\census2" (PDF). Archived from the original (PDF) on 2013-10-05. Retrieved 2010-02-05. ^ Shipping in Canada 2006 (Catalogue no. 54-205-X) (PDF). Statistics Canada. April 2009. pp. 26, 60. ISSN 1480-8773. ^ Shipping in Canada 2011 (Catalogue no. 54-205-X) (PDF). Statistics Canada. November 2012. pp. 28, 58. ISSN 1480-8773. ^ "Plant Line Ocean Trips". The Independent. Jul 6, 1914. Retrieved August 1, 2012. ^ Climate data was recorded at Port Hastings from October 1885 to June 1913 and again from June 1959 to September 1989, at Port Hawkesbury Airport from December 1985 to August 2004, at Port Hawkesbury from January 2006 to May 2009 and at Port Hawkesbury Airport from June 2010 to present. Wikimedia Commons has media related to Port Hawkesbury. This page was last edited on 29 December 2018, at 09:07 (UTC).